I shouldn't be so critical on the first CPL drives. Olivier Vernon is very active tonight! Welcome back, #54! I was on the old BBWC for years yet I am listed as a rookie? Looks like the start of a blowout...not surprised! No they're behind so that means they gotta throw a lot. Been saying it all year. Eli Eli Eli. As long as he is our QB this team will struggle and loose. He doesn’t fit in Shurmurs offense. He doesn’t. It’s a circle in a square hole. 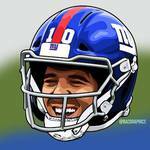 If Eli had time that's a big play.